PC Data Finder offers more search flexibility than the built-in Windows tool, and a speed improvement as well. When I performed the exact same search using PC Data Finder I got results instantly as soon as I clicked the Search button. Not only were the results fast, they were accurate. It searched a wider variety of files than the built-in tool and it even looked through my Outlook e-mail. How did it do all of this so fast? The answer lies at the heart of the tool. PC Data Finder uses an index to locate data with incredible speed. You need to create this index when you first install the software, and you need to keep it updated as time goes by, but this is a minimal amount of time to spend compared with the time you will save finding your data. Even updating is simplified because the index update procedure only reindexes files that have changed, not the whole drive. 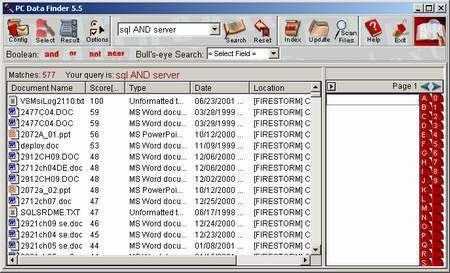 PC Data Finder offers powerful search results slightly marred by a non-standard interface. There are a few small drawbacks to this program, however, all of which lie in the interface. SilverLakeTech decided to try to create a really cool looking interface, but they failed to realize that users don't really want cool, they want functional and comfortable. For instance, if you select a file type for indexing then the interface shows you the file type with a gray checkbox with a check in it. If the file type is not selected then it is just a gray check box. Most of us are used to white checkboxes; gray almost always means that something is partially selected. Also, the buttons on the toolbar take some getting used to. The about and registration dialogs, for example, are not on the Help menu where you might expect them. They are at the far right of the tool bar, where you click on a picture (not a button) to bring them up. I know this seems picky, but users can get confused when you throw them a curve. Overall, despite the interface, this is an excellent product that delivers exactly what it promises and it can pay for itself the first time you use it. If you find yourself frequently searching for that elusive file, PC Data Finder is worth the investment.